Young children can develop infections in the lung, known as pneumonias. These can be potentially harmful, especially for those children without immediate access to emergency care. Doctors in clinics in under-resourced areas often travel between clinics and are unable to see patients on a regular basis - yet, they are the only health professionals trained to diagnosis pneumonia. With the Breath Abacus, however, allied health workers can simply slide the beads to count a child's respiration rate. The beads are color coded to determine the final diagnosis. An hourglass connected to the abacus counts down for one minute; if a red bead is counted before one minute is up, pneumonia can be diagnosed with high accuracy. 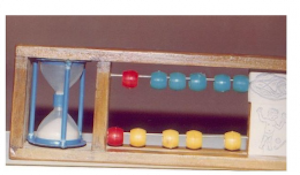 The abacus can be constructed with local materials according to the image shown in the solution description. 1600 pieces of the breath counter (with electronic timer instead of the sand timer) can be supplied at $10 per piece plus transport and packing charges. Abhay and Rani Bang have been researching and solving health issues in the Gadchiroli district of India for more than three decades. In 1988, they determined that pneumonia was the most frequent cause of death in rural children. Their case study of 100 rural villages brought children's and maternal health to the forefront of community health projects organized by their group, the Society for Education, Action and Research in Community Health. Both Abhay and Rani Bang are trained doctors and both hold masters degrees in public health from Johns Hopkins University.